Mr Harris has worked in the RUC (later PSNI) more than 30 years and has been intimately involved in some of the most controversial aspects of policing in the North. 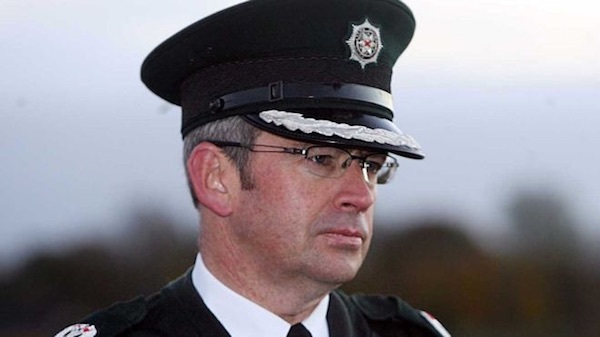 He has been directly linked to a number of cover-ups as the head of PSNI legacy affairs, and previously headed C3/Special Branch, the agency responsible for directing, arming and protecting state agents within loyalist death squads. His appointment as the first ‘outsider’ to head the Gardai came as a shock to Sinn Fein, who have yet to comment, but he has faced condemnation from the party in the past. When he was promoted to his current PSNI role in 2014, Sinn Fein’s Caitriona Ruane withdrew from the Policing Board panel to fill the post, saying she believed the process had been compromised. His new post attracts a salary of a quarter of a million euro a year following a pay increase designed to bring outsiders to the post. The 26 County Justice Minister Charlie Flanagan said he was pleased that the “rigorous selection process”, which lasted 10 months, had come to a conclusion. “Drew takes up office at a time of major reform and investment which will redefine An Garda Siochana as an organisation. As we approach the centenary of the establishment of An Garda Siochana, the organisation is on the cusp of significant change,” he said. Saoradh said the appointment of Harris as Garda Commissioner wasn’t a surprise. It described the police forces in both parts of the island as “counter revolutionary” and “violently opposed” to republican ideology. Condemning Harris as “a relic of colonialism”, it said his appointment would mean that the “corrupt” activities of the Gardai in recent trials of republicans would continue unabated. “Harris, under the terms of the Regulation of Investigatory Powers Act, has been operating under direction from MI5 for some time now. “What has the extent of these contacts been? Has Drew Harris ever been in the pay of MI5? Does he remain in the pay of MI5 or an agent of British Intelligence? “Harris has also been part of the RUC/PSNI leadership that has withheld information from families affected by state murder and collusion, and their legal teams.